A road of two halves, one known for its path along the top of Portsdown Hill Road, and the other forming the run up to it. Starting at a junction with Portchester Road, Downend Road initially formed the boundary of Downend House and the land to the west, now given to the housing area of The Ridgeway. To the east was East Cams Farm. Originally mapped as Downend Lane (until about 1910), from here it took an uneventful and slightly meandering path up the hill. The stone building was a lodge built in around 1890, with a few houses arriving in the 1900s but most not until the 1940s. 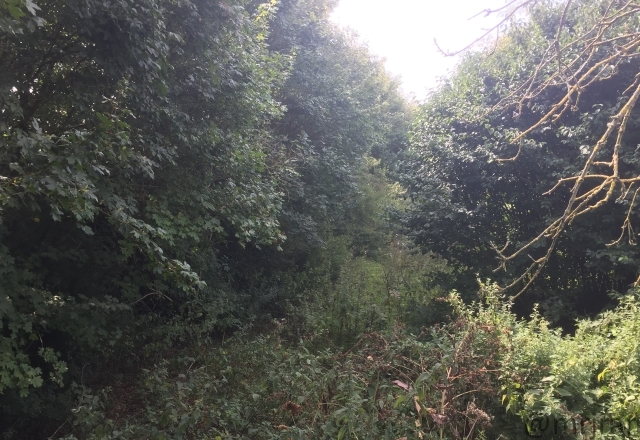 The Thicket was the entrance to the prisoner of war camp (E251), many of the residents of which would become visitors to the local area and eventually residents. Beyond the railway bridge was a chalk pit beyond it which remains noticeable on aerial views to this day. At the end of the 19th century a Whiting Manufactory was built on the east side of the road. This had its own tramway, and was joined by a chalk pit, and later Ellerslie House which went on to become the squash club and then the full health centre. The alignment of the next section changed considerably when the M27 arrived in 1976. Originally it followed much of the same course, which would have been expensive to bridge the new motorway at an angle and disruptive to replace the new road. Instead a new bridge was built considerably to the west, and the alignment of the old road remains just visible in the lines of trees and abandoned sections of road within the new recycling centre on the hill. There is now a shortcut through to Boarhunt Road, which is a private road provided to keep the Veolia trucks out of Downend. Wallington Military Road was built in the late 1800s, built to connect the forts, and quickly became the main route to the top of the hill. An upgrade to the junction in the 1940s saw Littledown Coppice lost and Warren Farm built. This was all severed by the motorway and redirected as a private access road around J11, but as part of the realignment of Downend Road a small section of it now lies abandoned. The street name changes to Portsdown Hill Road and a path up from Cornaway Lane joined here. If you take the footpath from Fort Nelson to Portchester, you'll come across one set of steps which are right on the line of the railway. I'd suggest this part of the tracks were in a cutting and the steps are climbing down to track level. At the bottom of the Fort Nelson car park (a former refuse heap), there are two rows of bushes which are a tracks' width apart. It's so overgrown that you'll probably only spot it from above. During the 2018 heatwave (which was photographed by Google Earth), some white marks appeared on the fields around here which perfectly match the rumoured alignmet of the railway. I'd suggest this is because of the way the tracks were filled in. Although I don't have any maps with the track on, I have one (1898) with an empty gap all the way along, and one (1870) with nothing on it. Also forgotten is a row of 12 cottages opposite Fort Nelson, which appeared in the 1890s map and were gone by the 1950s. Nelsons Lane became developed with lodges and cottages between 1910 and 1930; Trafalgar House was Lark Hill. Before the Military Road was built, Portsdown Hill Road only really lasted as far as Portchester Lane, becoming a narrow path after that. 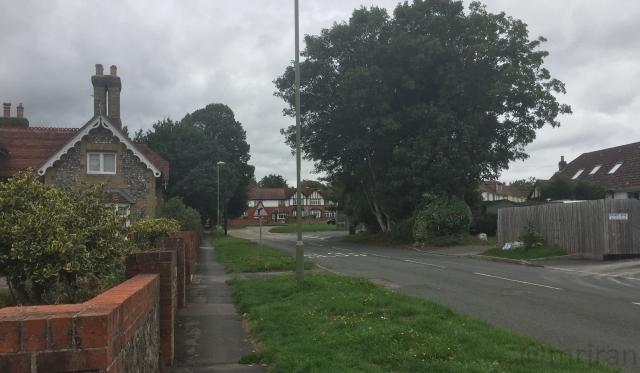 Hill Lane was originally connected to Portsdown Hill Road by four different paths: Nelson Lane, Skew Road, the straight path of Hill Lane, and an unnamed road that now forms a tiny section at the very end of Anson Grove. Each of these were removed when the M27 was built, and replaced by one bridge on Skew Road, although the paths can still be seen if you know what to look for. The subject of the forts has already been extensively covered by another site.